Need something spicy to keep you warm while grilling this Super Bowl? Nothing can beat some good ribs for the big game! But, sometimes they need to have a kick to warm you up. 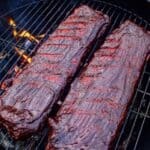 My Spicy BBQ Ribs recipe will sure get you fired up before the Super Bowl. Add some Cowboy Charcoal & apple wood chips and you will be set for your team to win! These Spicy BBQ Ribs go great with a fresh beer in an iced glass along with some chips and dip! Just make sure to give yourself enough time to cook these as they take around 6-7 hours! The flavor is perfect though as they are sweet & spicy all at the same time. Make sure to invite your friends over and cheer your team to victory. 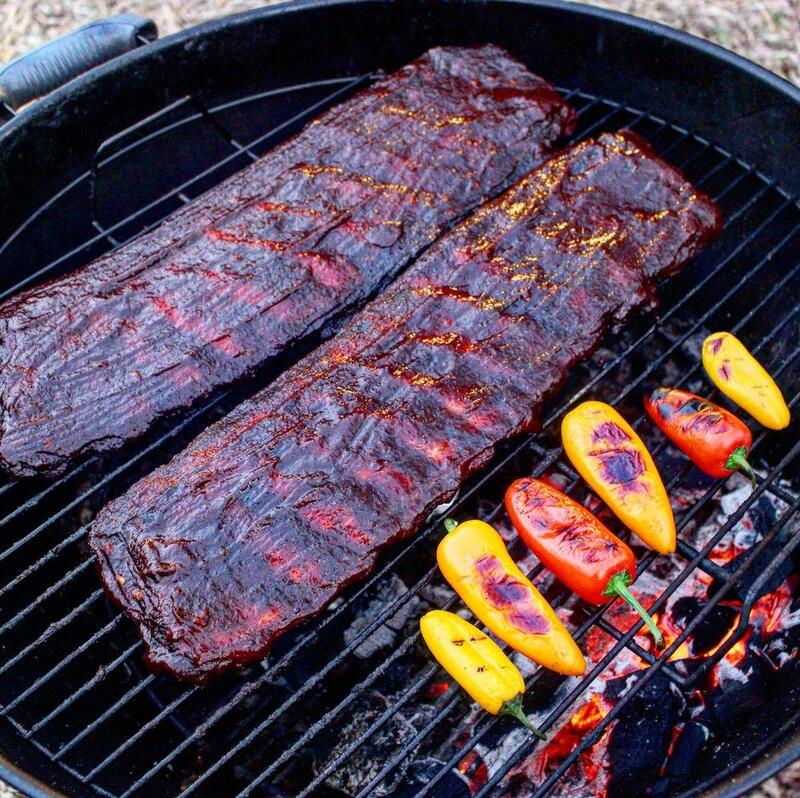 So whether you’re an Eagles or a Patriots fan, you will all love these new Spicy BBQ Ribs! RELATED RECIPE: Want Chicken for the Super Bowl? Try my new BBQ Ranch Chicken Recipe! 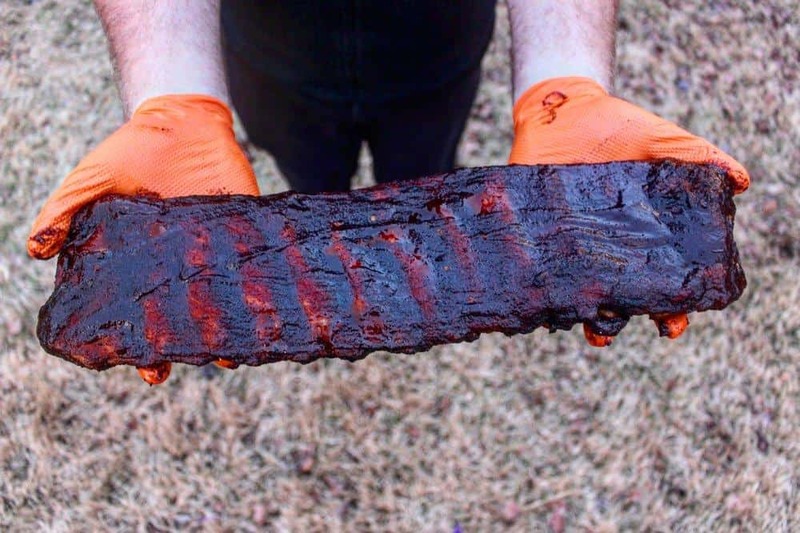 There are not a lot of secrets to good ribs except time and attention to detail. With my Spicy BBQ Ribs, I recommend that you follow the 3-2-1 method. In this, you will smoke indirectly for 3 hours with just the base layer of seasoning. Next, you will pull the Spicy BBQ Ribs off the grill and wrap in tin foil. Add some apple juice inside the tin foil wrap to keep the ribs juicy. You will grill them for another 2 hours. Finally, you will pull them off and grill over the direct flame while dosing in BBQ Sauce. This will get the crust you are looking for! In the end you will have some juicy and delicious Spicy BBQ Ribs! Peppers & Spicy Ribs Ready for the Super Bowl! Delicious and spicy pork ribs smoked over the fire then lathers & caramelized in bbq sauce. In a bowl, mix the brown sugar, chili powder, garlic powder, onion powder, smoked paprika, cumin, black pepper, sea salt, red chili flakes & cayenne powder thoroughly. Take the 2 rack of ribs and generously lather olive oil on both sides. Then, cover with the spices that you mixed above. Use some Cowboy Hardwood Lump Charcoal to light fire and let burn for 15-20 minutes. Once charcoal is white hot, push to one side of the grill for indirect grilling. Optional: For a more intense flavor, add some hickory or apple wood chips to the top of the charcoal. Place ribs on the opposite side of the charcoal for 3 hours. Make sure to only check a couple of times as when the lid is up the meat is not cooking. Pull ribs off and place in 2 layers of tin foil. Pour in the apple juice, wrap the tin foil and place the ribs back on the grill, indirectly, for 2 more hours. 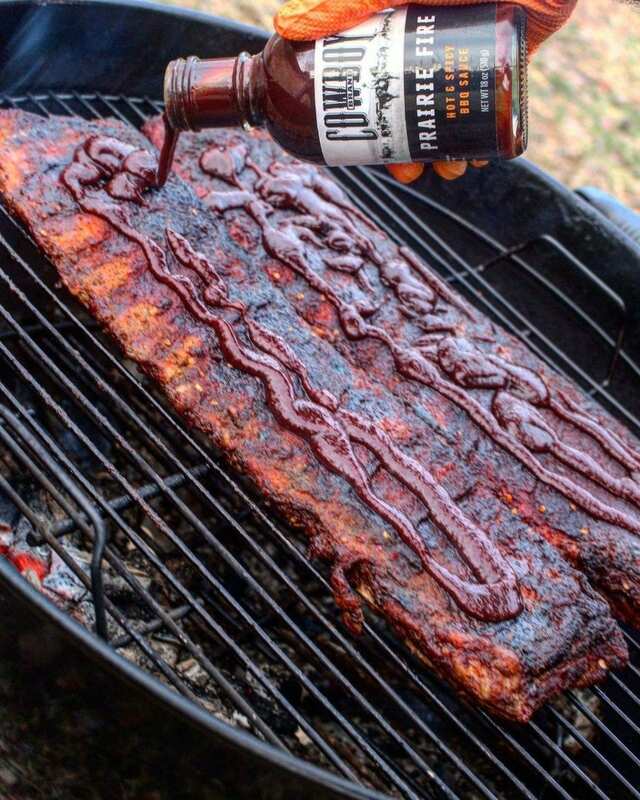 Finally, pull the ribs off the grill, remove tin foil and baste them in the Cowboy Prairie Fire BBQ Sauce. Place ribs back on the grill for another hour. Add more BBQ sauce as needed. Make sure to also keep adding charcoal & smoking chips as needed. Pull the ribs off the grill, serve & enjoy the game!